Supergirl 19 is easily the best issue of the book so far. 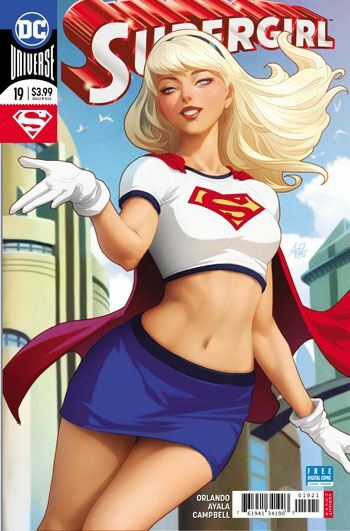 Curiously, Supergirl is not really the focus of this story, though she does appear on virtually every page. The story really gives the spotlight to a young woman, Lee, who encountered Supergirl a number of times over the years. Lee spends the issue talking about her relationship with Supergirl. 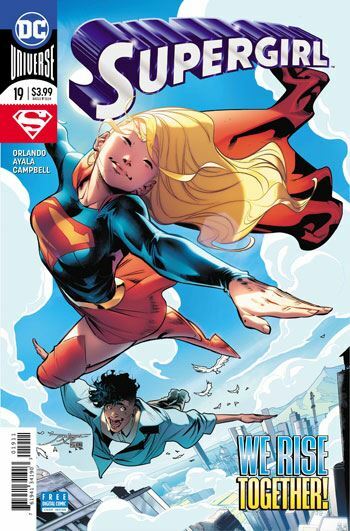 This enables a recap of various events from Supergirl’s books, including her New 52 series. Nice to see that Supergirl’s brief time as a Red Lantern has been kept canon. Lee was a bystander in her first meeting with Supergirl, and was surprised and touched to find Supergirl remembered her. As the story goes on, it becomes as much about Lee, and her struggles at home and school, as it is about Supergirl. Supergirl is not a hero for fighting villains in this issue, rather, she is a role model, for having the strength to stand up and be herself. Ultimately, her friendship with Supergirl gives Lee the courage to be open about her non-binary gender, and even be gracious and open towards a school bully, one who is going through a lot of personal stuff at home as well. This is a really positive, affirming story. There is no lack of action, and Chase and Director Bones have a scene that keeps the scheming subplots bubbling along. The art is really effective, especially the watercolour-like hues that are used. The art really works well in conjunction with the nature of the story, and the characters are lovingly rendered. I’m a sucker for action and battles, but when a smaller scale story is told as well as this one is, I appreciate it all the more.